The real estate investment trust raised its full-year outlook after successfully selling several of its properties. 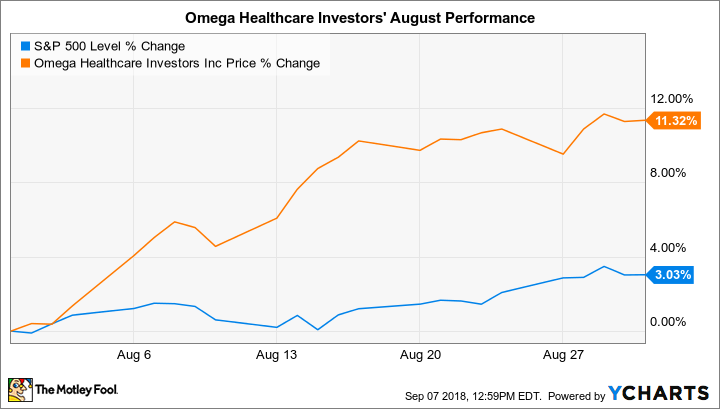 Omega Healthcare Investors (NYSE:OHI) outpaced the market by gaining 11% last month compared to a 3% increase in the S&P 500, according to data provided by S&P Global Market Intelligence. The boost has left shares of the real estate investment trust (REIT) up nearly 20% so far this year, compared to a 7% increase in the broader market. Investors were happy with the second-quarter earnings results that the REIT announced in early August. Revenue declined slightly during the period, and funds from operations, an industry metric that's comparable to profits, came in better than expected at $156 million, or $0.75 per share. Executives said this outperformance came from the fact that several property sales occurred later in the year than they had expected. CEO Taylor Pickett and his team lifted their 2018 outlook in early August while citing the strength of their property portfolio and the successful sale of several real-estate assets. "We can now focus on redeploying the proceeds [from the sales] and growing the business," Pickett told investors. Over the short term, management now sees adjusted funds from operations ranging from $3.03 per share to $3.06 per share to mark a modest improvement over the range they had issued three months ago.